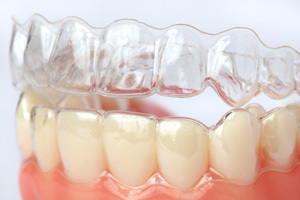 A series of custom-made aligner trays is used to gradually shift your teeth into place. Each tray is designed to move just one tooth or one section of teeth at a time. Once the tray’s work is complete (typically every two weeks), we move on to the next. Because there are no brackets and wires, clear aligners do not cause significant pain or soreness. In some cases, patients feel temporary discomfort (pressure) for the first few days after switching trays. That pressure may be uncomfortable but is actually a good sign that the trays are doing their job! Aligners should be worn for 20-22 hours per day. They should only be removed for cleaning, eating and drinking. To clean your aligners, simply brush and rinse them each time you brush your teeth. Treatment time typically falls within the range of 9-16 months. Some patients may also benefit from wearing a retainer after treatment is complete to prevent regression. This will all be discussed as part of your overall treatment plan. For more information on the various invisible braces solutions, please give us a call! You may also want to visit Invisalign or ClearCorrect for more information.